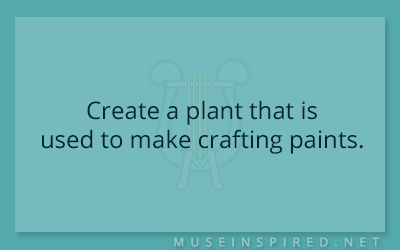 Fabricating Flora – Create a plant that is used to make crafting paints. A muse is a terrible thing to waste. Come inspire your muse with story prompts, affirmation, fantastic works of art, and happy healthy things. Feeding your muse once a day makes for a good life! Share us on Social Media! Fabricating Flora - Create a tree with the perfect branches for climbing. Fabricating Flora - Create a fruit popular for autumn drinks. Fabricating Flora - Design an ocean grass with beautiful flowers. Cultivating Cultures – Create a holiday dedicated to booze. Cultivating Cultures – What is the largest country in the world? Crafting Creatures – Create an insect that helps fight plagues instead of creating them. Fabricating Flora – Design a plant that almost seems sentient. Siring Settings – A casino under a waterfall. Character Development – Does your character have anything in common with their parents? Cultivating Cultures – What is the smallest town in the country? Crafting Creatures – Create a strange mashup of two different mammals.